The design seems very intricate and there's a snake or serpent attached? The bottom seems to be smooth. Thanks a lot! Looks like you were right...took it to an antique dealer today and he confirmed it was Japanese. He finds the dragon on it to be very unique due to the design and size of the wings. He's guessing it's from the 1920's-1930's. Much more then I knew! Thx again for your responses! Looks like porcelain to me. 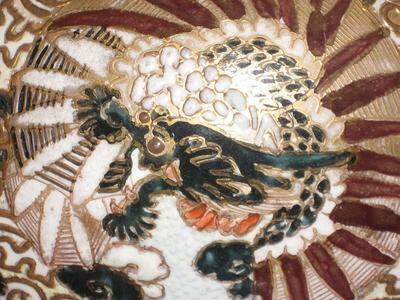 If part of the decoration is elevated (especially lines), this is a feature one or more of the Japanese kilns have. 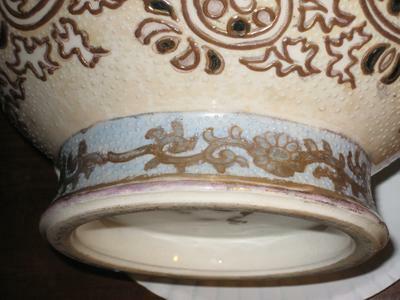 I do not know if this is Satsuma porcelain, but it could give you a start in further researching the subject. Appreciate the response! 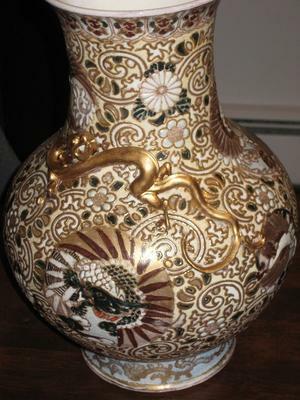 Could it be a cloisonne vase, in your opinion? 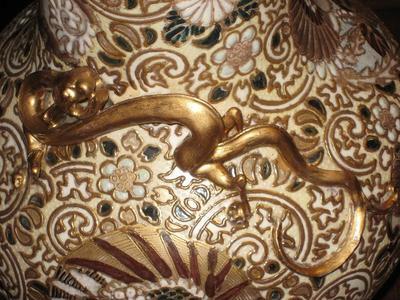 I have a couple cloisonne plates and the design looks very similar to me, but I really don't know much about this type of stuff and there's really nobody in my area to take it to. To me this is a Japanese vase at first sight.